In the US, the Federal Aviation Administration has long recognized that unauthorized laser illuminations of aircraft may have numerous hazardous effects on aircrew, including distraction, glare, afterimage, flash blindness, and, in extreme circumstances, persistent or permanent visual impairment ( FAA Advisory Circular 70-2A). As part of their effort to deal with the hazards posed by lasers, the FAA has encouraged air crew members, air traffic controllers, and the general public to submit reports of aircraft being illuminated by lasers. The FAA has collected this kind of data since at least 2004, and in 2011 published a study (Report DOT/FAA/AM-11/7) about 2,492 laser events that occurred in the US from 2004-2008 that characterized the patterns of exposure by their likelihood of occurrence by time of day and time of year. AirSafe.com has produced a follow up study using FAA data from 2010-2014 that included 17,663 laser encounters, which is more than seven times the number of reports analyzed in the earlier FAA study. Over that five-year span, on any given day in the United States, there is a 99.6% chance that at least one aircraft will have a potentially dangerous encounter with a laser beam. There were an average of 9.67 laser encounters per day. 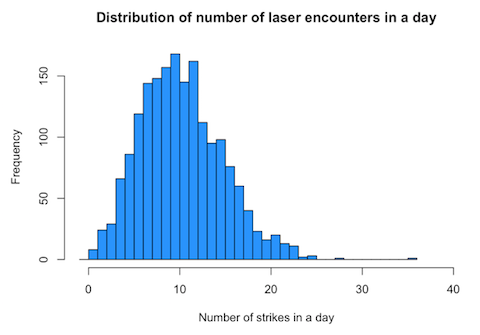 The most strikes in one day was 35, and there were no laser encounters on only eight days during that five-year period. Laser events were not uniformly distributed by time period, with laser encounters more likely on Friday and Saturday, during the months of July through November, and from 0000-0500 hours UTC. Comparing the proportion of air traffic in six selected metropolitan areas with the proportion of laser encounters in those areas, the proportion of laser encounters were much higher than the proportion of air traffic in the Phoenix, Los Angeles, and San Francisco areas, much lower in the Atlanta area, and about the same in the Chicago and New York metropolitan areas. Anyone who wants to educate flight crews, airport authorities, law enforcement and other relevant groups as to the extent of the problem (This could be done just cutting and pasting the graphics and basic stats in the report). Organizations that deal with policies related to the commercial	use of lasers, for example pushing for specific limits on what can be sold to the public. Organizations currently involved in understanding or reducing aviation safety risks associated with inappropriate use of lasers. Organizations, especially law enforcement agencies that, that seek to understand when and where the risk of laser strikes are highest.